The Church at Morley will host a free dinner for city residents on Saturday, March 1 at 6 pm at the church, 112 N. Kirkwood. From left, Jane Overbey and Ellen Gipson, church cooks, and Doug Sikes, church elder. On Saturday, March 1, the Church at Morley, 112 N. Kirkwood, will host a free dinner open to the community. Residents of the city are invited to bring their families and eat, starting at 6 pm. "We want to show our appreciation to the City of Morley," says Doug Sikes, church elder. "A hearty meal and fellowship gives us a great opportunity to get together with God's people -- churched and unchurched -- and we love to eat!" Sikes says the idea of offering a free meal is biblical. "Jesus said, 'give and it shall be given unto you.' We want to share God's love without being financially profitable in everything we do. We're not in this to make money. The blessing is in giving," he says. 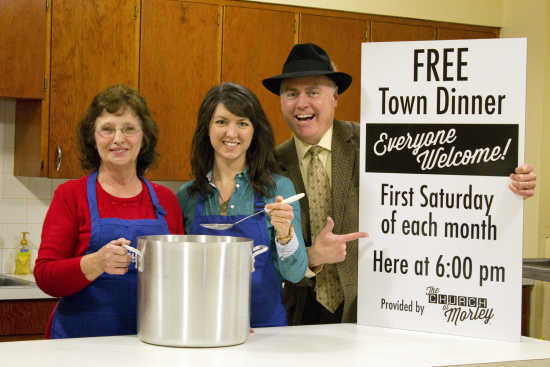 This free meal is the first monthly meal offered by the church. "We want everyone in town to come, hang out and have a delicious meal and get to know one another better," says Sikes. Future dinners will be held the first Saturday of each month. The Church at Morley is a non-denominational church that emphasizes a full-gospel message, congregational participation, enthusiastic music and worship, and a strong reliance on the Bible as its authority and guide. It has no official membership nor is it a part of any religious organization. The facility is open to the public with weekly worship services at 10 am on Sundays and 7 pm on Wednesdays.